Take I-75 North. Take exit 268 I-575 north toward Canton. Stay on I-575 North for 72 miles. You will pass through Canton, Jasper and Ellijay, and the highway will change names to Hwy 515 North. 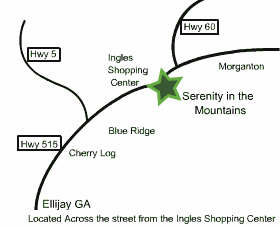 You will come into Blue Ridge (passing the Home Depot and Ingles shopping centers). You will turn right at the light just past the Ingles shopping center onto McKinney Road. Serenity is the located on the left (second left) as you go up the hill. Take 441 to US 64 West. Turn left onto NC-69 (crossing into Georgia) and go for 3.5 miles. Stay on NC-69 which will turn into GA-17/GA-515 in Georgia. Stay on GA-515 south for 32 miles. Turn left on to McKinney Road. Serenity is located on the left (second left) as you go up the hill. Blue Ridge, GA is located in central north Georgia near the Tennessee and North Carolina border. The Atlanta Metro area is only one hour and ten minutes south by car and offers the largest airport. You can also fly into a number of nearby cities with smaller airports and drive south to Blue Ridge. The Chattanooga, TN airport is roughly a one hour and twenty minute drive. Your route in from Chattanooga will take you along the scenic Ocoee River. There is also an airport in Asheville, NC, roughly two hours and twenty minutes away. Your drive down from Asheville will take you through the Nantahala National Forest. There is also a small commuter airport located in Blairsville, GA (just 20 minutes north of Blue Ridge). Your best bet is to fly into Atlanta and rent a car and enjoy the drive up through the foothills. There is an airport shuttle offering service to Blue Ridge. The “It’s Your Trip” Transportation Company can be reached at 706-633-3668 or on the web at www.itsyourtriptaxi.com.